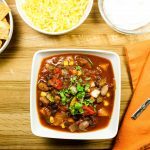 Slow Cooker Beef & Bean Chili is two beef & bean chili with the perfect bite of spice to warm you up on a chilly day! Weight Watcher friendly recipe- 7 SmartPoints! I don’t know about where you live, but here in Indiana lately the weather has been a rollercoaster! One day 60 degrees, the next it’s snowing. Talk about weird weather! It’s been a mild winter here, which has been great since this is my first winter in Indianapolis. When I’m stuck inside on those 30 degree days, there’s nothing I crave more than a big bowl of chili. 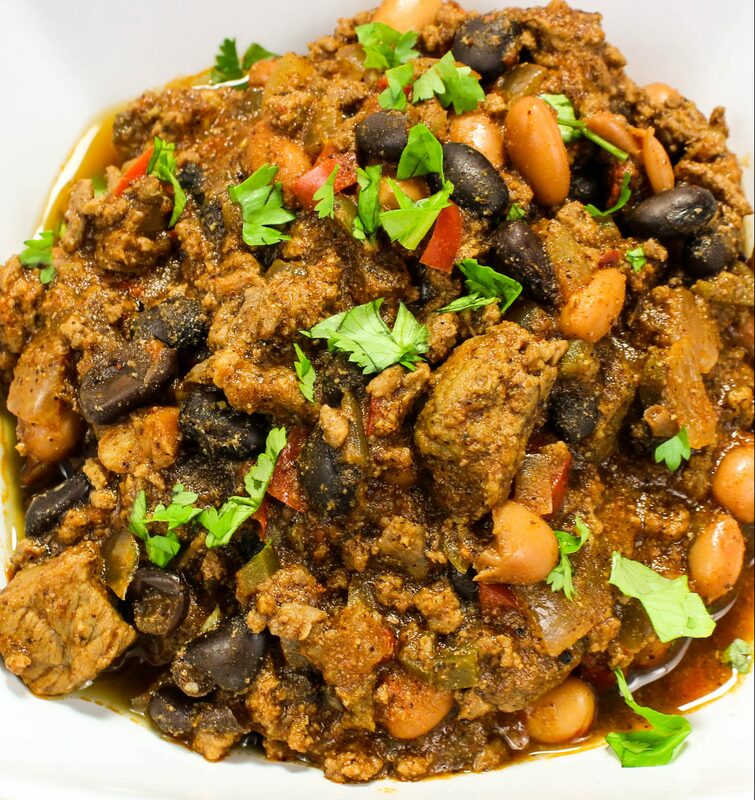 My Slow Cooker Beef & Bean Texas Chili is my take on classic Texas Chili. Two cuts of beef, two types of bean, and the perfect bite of spice to make you warm up on a cold day. This is a Weight Watcher friendly recipe and each serving is 7 SmartPoints. Surprisingly it’s only snowed 3 or 4 times here. Our first winter in Indianapolis has been totally bearable! In fact, a few weekends ago it was 60 degrees and sunny so dusted off our bicycles and rode around the city… which is our favorite thing to do on a Saturday afternoon: Biking around the city, seeing all the beautiful historic buildings, and exploring new territory. 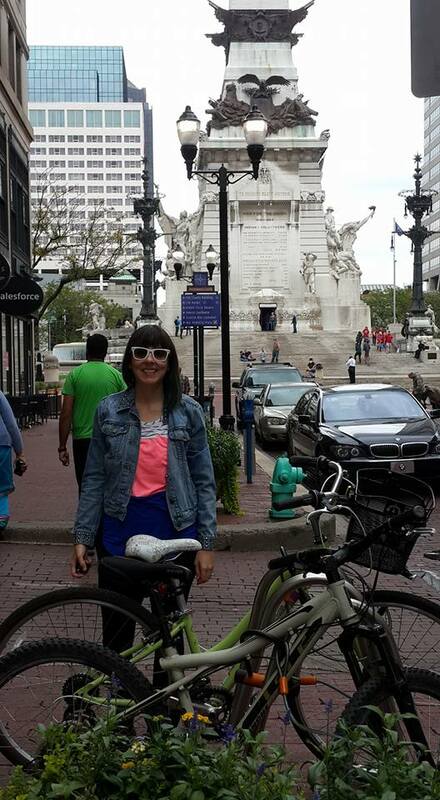 Indianapolis is such a bike friendly city and we love it. There is an urban bike and pedestrian path, called the Cultural Trail, which starts close to our house and runs all the way through downtown Indy. The Cultural Trail is one of the best things about Indy… it’s a paved, pedestrian lane that allows us to ride our bikes from our house all the way to downtown! Where we lived in Austin, there was no way we could ride our bikes around the city. Even though it’s technically still winter, if it’s 50-60 degrees outside, you’ll likely see us cruising around town and enjoy this awesome city! On the days that it’s cold outside, I’m inside making a batch of something that warms me up, which is usually soup, stew or chili. Chili in Texas is a sacred thing. If you are from Texas, you have to know how to make chili. It’s in our blood, just like making tacos and queso. There is even a restaurant in Austin dedicated to chili called the Texas Chili Parlor. Authentic Texas Chili has ground beef, onion, garlic, cumin, chili powder, chilies, and tomatoes… with no beans. You read that right… no beans. I know. I love me some beans so when I make chili, I add beans! This is my g-to chili. It’s very similar to the chili I grew up eating. The days that my mom make chili were the best days. I love her chili. In Texas, when you make chili, you have to eat it with cheese, sour cream, and fritos. It’s basically frito pie. It’s so good! If you order chili at a restaurant in Texas and it doesn’t come with fritos, they made it wrong ;-). 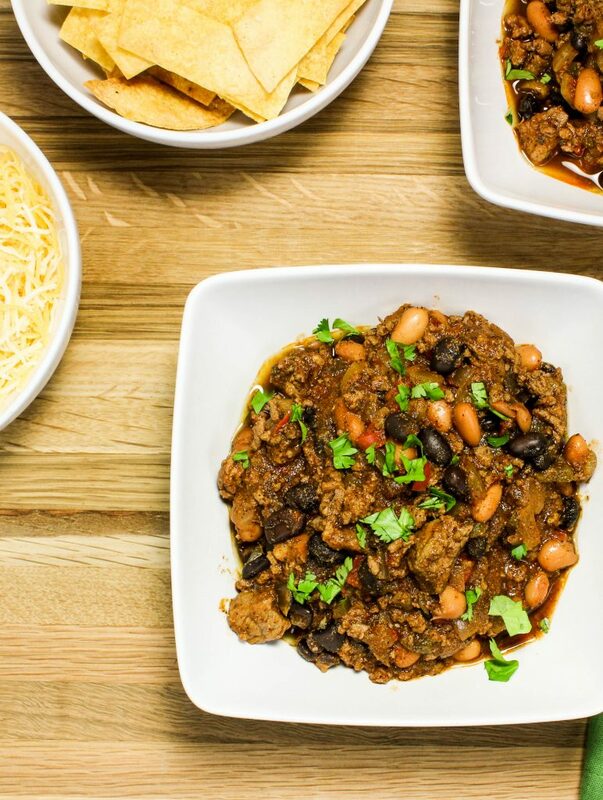 My Slow Cooker Beef & Bean Texas Chili is a nod to my mom’s classic chili, with a few tweaks. Anytime I make something in a crock pot with beef or pork, I always sear the meat before adding to the crock pot. This recipe calls for beef stew meat and ground beef. In a large cast iron skillet, brown the ground beef and stew meat for about 8 minutes. Season the meat with salt, pepper, chili powder, and garlic powder, then add cornstarch and tomato paste. This creates a nice gravy on the meat. Once the meat is cooked, add to the crock pot along with diced jalapenos, serrano, and onion. Add canned tomato sauce, water, and spices to the crock pot and cook on low for 8 hours. It will be the longest 8 hours of your life! This chili is so good that it will be hard to wait 8 hours to eat! 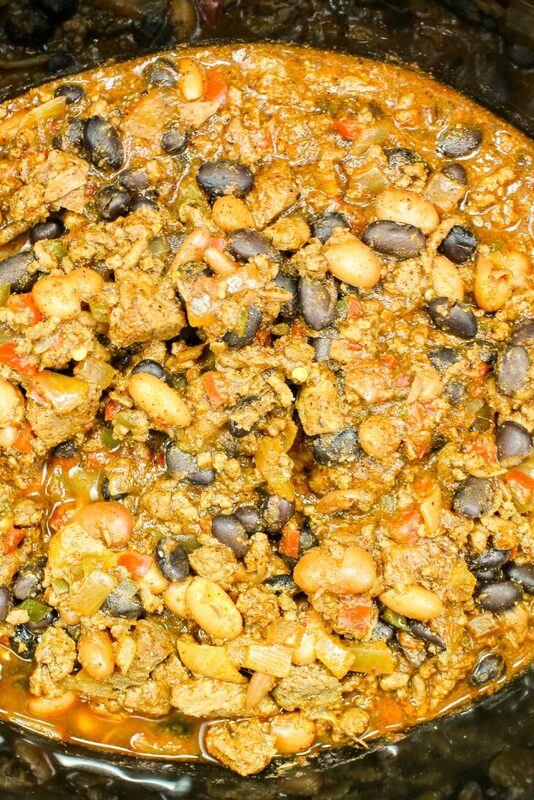 After the chili cooks for 8 hours, add pinto beans and black beans to the crock pot and cook for another 15 minutes. If the chili is too dry, add a little bit of water but not too much. This chili is thick and hearty with barley any liquid. The key to a good chili is cooking it for hours. One time I made this chili overnight in the slow cooker (so I could have it ready in the morning) and I kept waking up hungry because I could smell the scrumptious chili all the way upstairs! 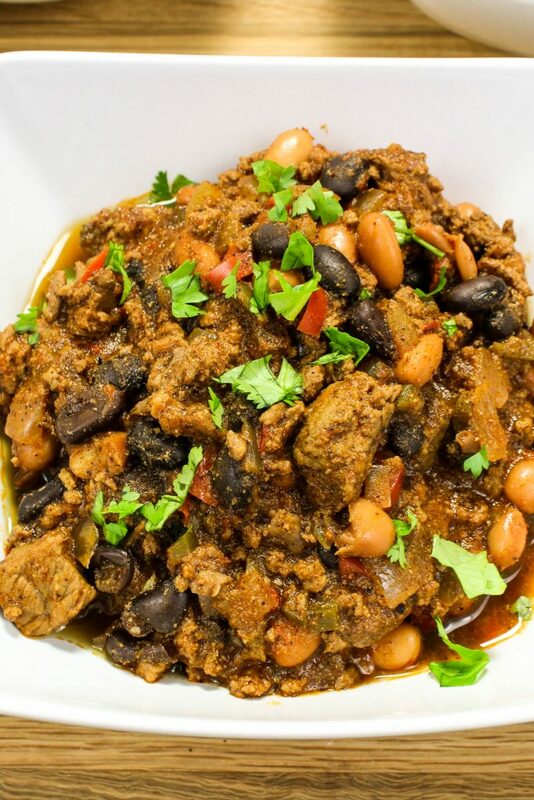 Slow Cooker Beef & Bean Texas Chili is my take on classic Texas Chili. Two cuts of beef, two types of bean, and the perfect bite of spice to make you warm up on a chilly day. Cooked low and slow for a bowl packed with tender meat and perfectly spiced. To make this chili Weight Watcher friendly, I like to serve with reduced fat shredded cheese, non-fat plain Greek yogurt, and homemade tortilla strips (rather than fritos). Hearty, healthy, and freezer friendly! 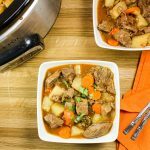 This is a great recipe to make during a busy work week… just dump all the ingredients into the crock pot in the morning, leave for work, then come back to an amazing dinner ready to go! I hope you enjoy these meaty bites of flavor! Cut stew meat into small chunks. In large skillet over medium heat, brown stew meat and ground beef for 8 minutes. Season with salt, pepper, 2 teaspoons chili powder, and 2 teaspoons garlic powder. Add 1 teaspoon cornstarch and tomato paste, mix well, and cook for 5 minutes. Dice jalapeno, serrano, and onion and add to crock pot. Add tomato sauce to crock pot. Fill tomato sauce can half way with water and add to crock pot. Add all the spices, stir to mix well, cover and cook on low for 10 hours. 30 minutes prior to serving, add canned pinto beans and stir. If the chili is dry, add ½ cup water. Garnish with cilantro, shredded cheese, sour cream, and chips. Stack tortillas on top of each other. Cut tortillas in half, then cut into strips. Lay strips in even layer onto sheet. Spray tops of tortilla strips with cooking spray and season with a pinch of salt. Bake in the oven for 8 minutes until strips are crispy. 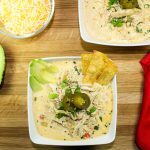 February 16, 2017 at 11:33 am I love crock pot meals and this one looks great!! We are having crazy weather here in New York too!! February 21, 2017 at 10:11 am Thanks Leah! 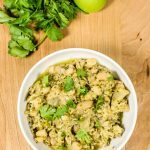 February 21, 2017 at 10:11 am Thank you for checking this recipe out Rose! February 21, 2017 at 10:10 am Oh yes! Cornbread would be so good with this chili! February 16, 2017 at 6:52 pm My husband is going to love this! Going to print it out right now! February 21, 2017 at 10:03 am Thanks Danielle!! February 17, 2017 at 8:38 am This is a perfect dinner to stick within my Weight Watchers points for the day!! And it looks SO YUMMY! February 17, 2017 at 2:14 pm Oh yum! Thanks for doing the points calculation too - makes it easy to see this will fit into my WW day! February 21, 2017 at 10:01 am Yes! This is a great low point dinner option!